MRPL is accredited with ISO 9001: 2008, ISO 14001:2004 & ISO 50001:2011. 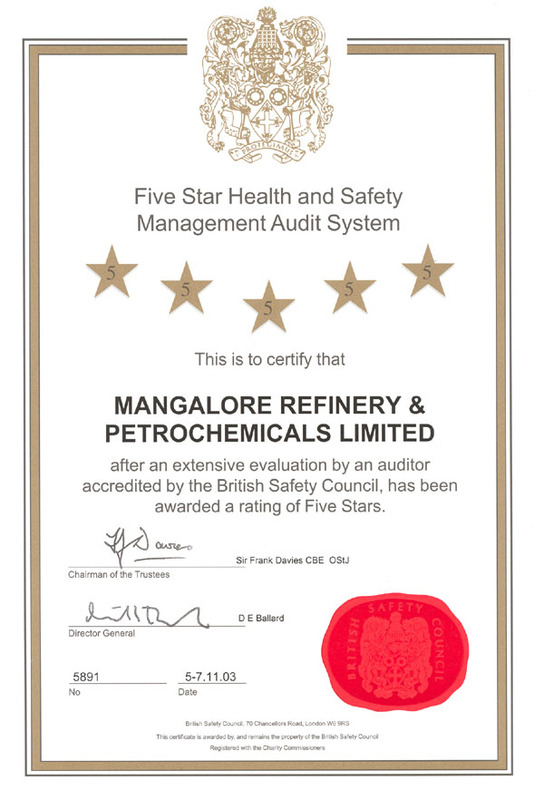 Company has been awarded 5 Star rating for its Health and Safety Management system by the prestigious British Safety Council, U. K.
The fire prevention and protection systems at MRPL have been developed keeping in view the hazardous nature of the Refining Industry and conform to OISD and TAC guidelines. Safety Statistics : MRPL successfully achieved 294 accident free days as on 31st March 2017 without Reportable Lost Time Injury (RLTI) and the previous best accident free days was 1662. Safety Award : The Safety Award Policy for accident free days has been constituted as an incentive to encourage employees and contractors to practice and ensure Safe work environment. Area Safety Committee : On the departmental level Area Safety Committees (ASC) headed by the respective GM / DGM and comprising of Supervisory and non-Supervisory staff have been set up to meet once every month to evaluate, control and investigate factors that have accident potential and provide solutions. Central Safety Committee : An Apex body known as the Central Safety Committee is established with the purpose of reviewing and monitoring the Refinery Safety Management System. The CSC meets once every month under the Chairmanship of GGM (I/C. Refinery) with Chief Manager (Safety) as its Secretary. The Committee includes all ASC Chairmen, H.O.D's, Chief Medical Officer, Welfare Officer and Purchase Department representative. Work Permit System : MRPL has devised Work Permit System based on OISD guidelines to ensure jobs are performed in a safe manner with the active cooperation of the Operating and maintenance groups. Fire & Safety verifies compliance of written advice and erring parties are suitably advised for corrective action. Various Work permits prevalent at MRPL are given below. Audits : Various Audits have been conducted by renowned external agencies like British Safety Council, KLG-TNO, LPA, Munich Re, HPCL and OISD. The high level of safety awareness achieved at MRPL has been lauded by all such internationally acclaimed Audit agencies. Publications : Safety Newsletter is published every quarterproviding safety information. Subjects related to our Housing Colony including evacuation procedures is also published and circulated. Fire & Safety Manual, Onsite Emergency Response Management Plan, Job Safety Procedures, Material Data Sheet (MSDS), safety in Transportation of Hazardous goods are published and also displayed on MRPL's intranet for the benefit of all employees. Training for Employees : Training in Safety & Firefighting is an ongoing full day program conducted every week involving Plant employees. The curriculum of the training program includes theoretical classroom lectures at our dedicated Training Centre followed by simulated live firefighting training at the Fire Training ground having various models designed as per OISD. It is mandatory for every employee joining our company to undergo one-day induction training program on Industrial Safety and subsequently Refresher Safety program once in a year. Training for Contract employees : Each and every Contract workmen are covered under periodic half-day training programs. Refinery Entry gate passes to contract workmen are issued only after they undergo MRPL's Industrial Safety Training. Safety First is the Company's motto. Continuous training on plant safety for employees and contract labourers. Training on safety for neighbouring industries. MRPL is the convener of the Mangalore chapter for the National Safety Council. Work environment, Air quality, Noise and Safety parameters (occupational exposure) monitoring at regular intervals are being carried out. Awareness programmes about occupational Health & safety aspects at petroleum refinery (unit wise), potential accidents and the associated risks etc. Regular Training Programmes are conducted for all employees on Health, Safety, firefighting, necessity and use of personal protective equipment, Emergency mock drills etc. Safety and Environment Audits are conducted regularly at refinery by external agencies including Oil Industry Safety Directorate. The recommendations emerging out of audit studies are implemented on priority basis. MRPL has a full-fledged Occupational Health Centre (OHC) within the premises headed by Chief Medical Officer. a) Medical Examination < 40 Yrs : The Hospital carries out Periodic Medical Examination of the employees below 40 yrs. The Tests comprises of General check-up including medical parameters HB,TC,DC,ESR, RBS, Urine Routine, Vision Tests. b) Medical Examination > 40 Yrs : The tests are : HB, TC, DC, ESR, FBS, PPBS, Lipid profile, Urea, Creatinine, Urine Analysis, Vision Tests, ECG, spirometry and X-Ray besides physical examination and CVS risk analysis. c) TMT & Echocardiography Tests for Employees > 50 Yrs. d) Papsmear & Mammogram Test for Women Employees. e) Special Eye Testing : Special Eye testing are being carried out at random basis for different departments (Colour vision also done). f) Audiometry Tests : Audiometry tests are being carried out for all the employees working in high noise area. g) Canteen Employees Medical Examination : The following tests are being carried out:Cholesterol X-ray, ECG & General Check-up, HBSAg HB, TC, DC, ESR, U.A. HIV, VDRL & Gen. Check-up. Albedazole, Tinidazole tablets have been given to all canteen employees, as they are food Handlers. h) Benzene in Urine using advanced Chromatograph : Benzene in urine tests are conducted to target group of employees and so far no abnormalities have been observed. i) Medical check-up for contract workmen : Regular medical check-up for contract workmen is being carried out regularly, the tests includes HB, TC, DC, ESR, FBS, PPBS, Lipid profile, Urea, Creatinine, Urine Analysis, Vision Tests, ECG, X-Ray besides physical examination and CVS risk analysis.Action taken, when employee were found to have been affected.